Increased production speeds have lead to increased wear on equipment causing preventable downtime. Nylatech nylon has the ability to outperform UHMW's and urethane's in many sawmilling applications. 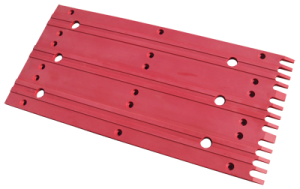 Nylatech PVM (Pressure-Velocity-Maximum) is used frequently as a chain bed/liner which requires approximately 75% less lubrication and significantly increases the life of the chain. The bed is precision machined to ensure maximum efficiency. It's also easy to install and requires little maintenance. Nylatech Nythane has the same positive qualities as standard nylon grades - excellent impact values, wear resistance, and rigidity; but has the added benefit of less moisture absorption and a lower temperature tolerance.